Here are some notes I made on Joseph H. Lewis’ film, Gun Crazy, in the early ’70s. Or, rather, here are some lines that I copied from Albert Camus’ essay, “Abraham, Sisyphus and the Furies” under the heading “Gun Crazy“. They do bear on that film, but they can also serve as a general introduction to the work of its director. Camus does not know it, but he is writing about a film he never saw. And here is a set of quotations taken from a few of the writers who have found something to marvel at in the work of Joseph H. Lewis. The Forties were characterized by the proliferation of “B” Westerns.At Universal, the Johnny Mack Brown series provided some of the best and fastest Westerns, full of action and made with excellent production values; particularly notable were the musical scores and first-class camera work (the running inserts and fast tracking shots in Universal’s Westerns in general put to shame those of any other studio).Stories were unified, but rarely remarkable; action was the key element and such directors as Ford Beebe, Ray Taylor, Lewis D. Collins, and particularly Joseph H. Lewis never failed to produce works of at least some interest.Lewis used running inserts to excellent advantage, and his sweeping shots of chases in The Boss of Hangtown Mesa (1942) were exceptionally good. -William Fenin and William K. Everson, The Western: From Silents to Cinerama, Bonzana Books, 1962, p. 255. Although excellent entertainment for dyed-in-the-wool fans, the sameness of this series was pointed up when a really imaginative director was put to work on one of them. Joseph H. Lewis, who directed Arizona Cyclone, was a former film editor, and it showed. He broke down a simple confrontation between the hero and villain into a number of tense shots, cross-cut between hands poised over holsters, changed focus within the shots, and added speed and depth to his chase scenes by placing objects (tress, fences) between his camera truck and the riders, or by having his truck on a different ground level from the horses. Arizona Cyclone was a perfect example of how to add real style and directorial finesse without radically changing the script. -William K. Everson, A Pictorial History of the Western Film, The Citadel Press, New York, 1969, p. 196. Lewis’ nickname was “Wagon Wheel Joe”, a name he received early in his career when he was shooting B westerns for Universal. He had a penchant for framing shots through the spokes of the nearest wagon wheel, to break up the visual monotony of a scene. Several of the editors at Universal complained to the studio brass that they had a hard time cutting Lewis’ films because “he keeps putting these damn wagon wheels in front of everything”. Director Oliver Drake, who was a friend of Lewis’ and also his boss on those westerns, jokingly referred to him as “Wagon Wheel Joe”, and the name stuck. According to Edward Bernds, Lewis was considered something of a pain by his western crews. He was supposed to have offered to direct westerns for his salary as an editor, undercutting the popular (and untalented) Sam Nelson and alienating his old crew, “so Lewis had no control at all”. -Bernds qtd. in Tom Weaver, Poverty Row Horrors! : Monogram, PRC and Republic Horror Films of the Forties, McFarland & Company, Jefferson N.C., 1993, p. 4. Back in the Spring 1962 issue of Film Culture, a critic, writing on “The High Forties Revisited,” remarked: “If some bright new critic should awaken the world to the merits of Joseph Lewis in the near future, we will have to scramble back to his 1940 record: Two Fisted Rangers, Blazing Six-Shooter, Texas Stagecoach, The Man From Tumbleweeds, Boys of the City, Return of Wild Bill, and That Gang of Mine. Admittedly, in this direction lies madness.” Well, madness is always preferable to smugness, and scramble we must because Lewis has been discovered. After several years of Poverty Row, he made The Minstrel Man with Edgar G. Ulmer no less as his set designer. Then in 1945, My Name is Julia Ross became the sleeper of the year. From that point on, the director’s somber personality has been revealed consistently through a complex visual style. It would seem that his career warrants further investigation. -Andrew Sarris, “The American Cinema”, Film Culture 28, Spring 1963, p. 25. -“3”, Rick Thompson, Cinema 7 (U.S.), Fall 1971, pp. 46-47. (See the revised reprint in this issue of Senses of Cinema). One of the few points at which the classicists (Wm. Everson) agree with the auteurists (A. Sarris), Joseph H. Lewis is the American cinema’s existential anarchist. As Ado Kyrou has argued, the amour fou of the couple against the world in Gun Crazy constitutes a brief for outlawry – and that sympathy for the outsider, the abnormal or downright anti-social being, extends back at least to Lewis’s PRC period (Secrets of a Co-Ed) as well as forward to Terror in a Texas Town. Heroism in these films is diffident and underplayed, a matter of the dogged struggle for the right to choose rather than any fight for love, glory or even life itself. His stark, dramatic compositions strive for immediacy of effect at all costs – now in unpolished newsreel fashion, now in shadowy borrowings from Expressionism. So also, the acting he elicits alternates between the highly stylised and the deceptively casual. Such seeming inconsistencies of technique are to be expected from one whose advocacy of intuition and unreason places impact above narrative logic, experience above efficiency and, yes, existence above essence. It is with Joseph H. Lewis that the principle of mise-en-scène dear to André Bazin, founded on the shot-sequence and depth of field, finds its most perfect application while affirming a style proper to B cinema. Lewis likes long shots with no camera movement on condition that they have depth (The Halliday Brand, 1957) and complex virtuoso camera movement like the ten minute shot sequence in the courtroom in Secrets of a Co-Ed (1943) which links long shots and big close-ups [plans larges et gros plans]. When the fever seizes a camera resonating to the madness of the characters, the films make manifest that adhesion (Gun Crazy, The Big Combo). But when virtuosity is not elevated by the power of a dramatic situation, the outcome, brilliant though it may be, suffers from dryness, a victim of its gratuitousness. Jacques Tourneur used to like to compare himself to a cabinet maker, conscious that the result (the film) was dependent on the quality of the materials (the scenario). Lewis sets that reasoning aside; he behaves like an alchemist-director, a forger of genius – pine always looks like oak in his work, thanks to the polish of his style. You can have reservations about this principle or you can like it for the same reason: where ostentatious decorum is not in fashion, B pictures constrain a cinéaste defying the facilities of genre engendered by the poverty of means to believe in the all-powerful nature of mise-en-scène, imposing, with the help of his camera alone, an authentic quality of writing. -Charles Tesson, Photogénie de la série B, Cahiers du cinéma, Paris, 1997, p. 89. It is testimony to how little we appreciate, how little we sense the cinema that the work of Joseph H. Lewis remains virtually unknown. Most people simply cannot see the intelligence in his films. Yet there is a clear intelligence in his style: his camera placement, movement, articulation of space, character movement – the choices a director makes. And there is clear intelligence in the suggestions, inferences, he can elicit from the stories and situations that he turns into cinema. What you see on the screen in a Lewis film are not recipes learned at film school or from studying the work of Perfect Masters: they are responses to questions like, “How can I make this more interesting?”, “How can I do this right?” Lewis was not a hack, like Edward Bernds, nor an obsessive visionary, like Sam Fuller. He was a smart guy who knew more about what he was doing than we do. What is surprising, and so rare, about this smart guy is how generous he was. When I watch so many films these days, I realise how grateful I should be that the Artists who make them have allowed me to share, however briefly, their terrible, beautiful Visions. I have not experienced their generosity, but their munificence, a quality employed in the attainment and maintenance of power. When I watch a movie directed by Joseph H. Lewis, there is no fuss and no fanfare about what he is giving me, the time he has taken, the thought, the passion he has spent. It is all done so simply that in the end, I have no time and no opportunity to thank him. And here are some notes on a few of Lewis’ films, culled from various places. The section on Gun Crazy contains what is, I think, the most influential piece written on Lewis’ work and is, I think, translated in full here for the first time. Lewis goes artsty-fartsy in Boys of the City, too: shooting from inside the fireplace, dollying his camera “through” walls, giving far more attention to the composition of shots and the arrangement of people and props than any of the hack Monogram directors. This attention to detail greatly enhances the visuals in Boys of the City, but the mood of tension Lewis almost succeeds in achieving is dispelled every time an East Side Kid opens his mouth. -Tom Weaver, Poverty Row Horrors! : Monogram, PRC and Republic Horror Films of the Forties, McFarland & Company, Jefferson N.C., 1993, p. 4. I have learned two things about Lewis’ work from this film. 1. His films consciously create self-contained fictional universes. Tom Weaver, along with most other trash critics and sensible people, finds The Invisible Ghost hard to accept. He thinks it is because too many unbelievable things happen in it (a “mad woman” [Betty Compson] wanders around at night but is never discovered by the police who are investigating serial killings in the area; servants still want to work in a house associated with serial killing, etc.). But many of the people who find this kind of thing risible in cheap forties pictures by American directors are willing to overlook it in cheap eighties pictures by European directors like Dario Argento and Jess Franco. The point is that Americans and Europeans alike are working out of the same (nineteenth century) tradition of oneiric fantasy in which place is opportunistically defined by atmospheric resonance and symbolic value. In such films we are in the realm of fairytales. The diegetic universe of The Invisible Ghost is anchored in the very first shot, which shows a painting of Kessler’s (Bela Lugosi’s) wife. A portrait transforms a person into a place, a fixed location infused with meaning. This painting is, metaphorically at least, the heart of Kessler’s house and its surroundings which the film articulates as variations of private, domestic space. Public, institutional space is shown in two very abstract sequences later in the film, both of which contrast violently with the space of the house (an innocent man’s trial and execution for murder, and Kessler’s visit to the coroner). The house exerts a particular, irrational pull on Kessler, who refuses to leave it in spite of the killing that continues to take place in it. The film makes it clear that his refusal is connected to his obsession with the woman in portrait, his dead wife. I believe that all of Lewis’ work strives to make purely fictional, cinematic, places rather than “realistic” ones. This is why he framed shots in his westerns through wagon wheels. 2. Lewis’ films are films of ideas. “They think with movement-images and time-images instead of concepts.” (1) Tom Weaver, who does show a keen appreciation of Lewis as a director, says the film’s title is “meaningless”. He thinks that Mrs Kessler is “neither invisible nor a ghost” (31), but he is wrong on all three points – mainly because he does not believe that this film is thinking. Mrs Kessler is first introduced to us in the portrait, which shows her as the woman Dr Kessler loves even in death. It is their anniversary, and Kessler dines “with her”, treating an empty chair as though she were still in it and they were still a loving couple. Right away, then, we have been given an invisible ghost that is, indeed, in an important sense, Mrs Kessler. But it is not long after this that the character of the mad woman is introduced and almost immediately identified as the “real” Mrs Kessler, who survived the automobile accident that her husband believes killed her and has for years been hidden from the world by the family’s faithful gardener. This is a strange character. Her face is mask-like and she says her beauty has gone. She wants to go home but cannot. She is drawn to the house on certain nights when she stares through windows at Kessler. Kessler always senses her presence, and after he sees her he goes into a trance in which he is compelled to kill the next person he sees. He remembers nothing of seeing her or of what he has done. That is, to him, this visible woman and what he visibly does as a result of seeing her is entirely invisible. The mad woman is the other side of the figure in the portrait: “alive”, “not beautiful”, not what Kessler loves, harbinger of death. The film devotes a great deal of time to the scenes in which Kessler is drawn to the window while she is outside and to the exchange of looks which results and to the words she sometimes says (“I’m afraid to come home. You’d kill me … You’d kill anybody“). What appears to be happening is that Kessler is obeying an impulse to kill which she transfers to him: that she summons him to the window for this purpose. This impression is confirmed at the climax of the film, after she has been brought back “home”, into the house and face-to-face with Kessler, and her entirely unexpected death suddenly brings him out of a killing trance. But if this mysterious transference is what is really going on, then this “real” woman is something other than a crazy human being. And, indeed, all of her behaviour is very like that of a ghost which has been prevented by love and hate from finding peace, returning constantly, seeking vengeance. More important than the title, however, is the couple that the title masks even as it articulates it indirectly. This too is a film about l’amour fou. The last thing that Kessler says is to the portrait: “Nothing can part us now, my darling.” These words convey much the same sense that Bart’s last words to Annie Laurie convey in Gun Crazy – and what is most remarkable is the way in which the Kesslers, bound together by mutual and conflicting passions, foreshadow the doomed couple of outsiders to come. It also boasted quite the most ambitious and atmospheric direction of any of the films, thanks to Joseph H. Lewis (the future helmsman of Gun Crazy and The Big Combo), whom [Sam] Katzman must have been rewarding for having survived the handling of the East Side Kids on their maiden voyage, Boys of the City (1940) . . . Lewis had brought some style even to that lowly opus, but he pulls out all the stops on The Invisible Ghost, as if to show the world just what he could do. 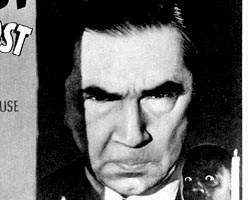 Much of the time, he succeeds: interesting angles, creative camera placement, elaborate focus-shifts, a good deal of fluid camerawork, the ability to genuinely maximize Lugosi’s fright potential, all combine to showcase the director. Lewis constantly amazes the perceptive viewer by his ability to get so much out of so little – the entire trial and execution of John McGuire’s initial character . . . is effectively conveyed without anything resembling a courtroom or death row set. It is all suggested, but done so shrewdly that it isn’t apparent unless the viewer actually breaks down what is happening. -Ken Hanke, “Supernatural – Perhaps … Baloney – Most Definitely!”, Video Watchdog 61, July 2000, p. 32. It is funny that Charles Tesson, who writes so well about Joseph H. Lewis in Photogénie de la série B, would call this “un bon film de gangsters” (86) when it is nothing of the kind. It is a pulp spy mystery (released before the U.S. entry into World War 2) with a storyline that might have been lifted from Dime Detective Magazine. Lewis had previously directed Navy Spy (1937, with Crane Wilbur) and The Spy Ring (1938), so he was something of a specialist in this genre as well as westerns by 1941. The protagonists make a couple of outsiders. Greg (Eric Linden) is a corporal in the army but he never seems to obey orders or even to address his superiors as anything other than equals. Linda (Ann Doran) is a reporter who watches him doing some pretty suspicious things but waits to file her story until she knows what is really going on. In the end they kill a couple of spies as an afterthought by cooking them in an experimental “fever chamber”. They are parallelled by a “comic” black couple (Bernice Pilot and Dudley Dickerson) who are actually the best actors in the film and who are literally shut out of the action at the end. The spy ring is headed by a Sergeant on the army base (Ben Alexander) who is Greg’s best friend. Both the army base security team and military intelligence are marked by unnecessary secretiveness. The base team is headed by a Lieutenant in love with one of the spies and the team’s Sergeant is feeding information about the investigation to his friend Linda, the reporter. Both the military and the spies spend most the film attempting to curtail Greg’s freedom: they collude, albeit unconsciously, in trying to trap and imprison him. Moreover, both factions act precipitously, before events have run their course, basing their actions on incomplete evidence and overhasty inferences from what they see. Both sides want control while both protagonists want freedom. The action sequences revealed Lewis in perfect control, and later, more prestigious, films, from On the Waterfront [Elia Kazan, 1954] to The French Connection [William Friedkin, 1977], would find inspiration in the trim, violent scenes in The Undercover Man. In one, Warren [Glenn Ford] and the suave, corpulent shyster (Barry Kelley) are threatened by an onrushing car in an alley, and, without being unduly explicit, Lewis makes the viewer cringe with the awareness that the shyster is doomed by his vulnerable bulk. In another, a street chase appears to take flight via a marvelous tracking shot of the hunted main (Anthony Caruso) dodging pushcarts and unconcerned passers-by, and the chase fades out on a shot of his little girl (Joan Lazer) staring in horror at his body sprawled among the trash cans. During this breathless pursuit, Burnett Guffey’s camera made the familiar Columbia backlot teem with the bustle and breath of a slum on a summer day. -Carlos Clarens, Crime Movies: From Griffith to the Godfather and Beyond, W. W. Norton & Company, New York, 1980, pp. 228-229. Joseph H. Lewis’s Gun Crazy does not reach the heights of Fritz Lang’s masterpiece [You Only Live Once, 1937], but of all the recent films with the theme of the couple pursued by society it is – by far – the most poetically subversive. A lot of fuss has been made about They Live By Night [Nicholas Ray, 1948], a supposedly “maudit” [damned] film, moralizing and annoying – oh how annoying! The heroes of that film are rebellion’s petits bourgeois, functionaries of life “outside the law”, the Antoine and Antoinette of crime. Much more uplifting are Annie Laurie Starr (Peggy Cummins) and Bart Tare (John Dall) who make the admirable couple of Gun Crazy (2). This film, based on a novel by McKinley Kantor, was taken in hand by Joseph H. Lewis who infused it with a grand and passionate movement. Bart Tare has always had a passion for guns. It is under the sign of the Colt that a great love will be born. Twelve years have passed since You Only Live Once. A new war, the most murderous in history, has brought radical changes in human desire. Eddie and Joan [of You Only Live Once] wanted to run away, to live happily with their love. Bart and Annie Laurie want “to really live” [“bien vivre”]. Why has a coercive society prevented a very beautiful girl from being well-dressed? Respectable feelings are a mask; strong in their love, the heroes of Gun Crazy spit on respectable feelings. Society has made deadly weapons the order of the day; they will use them to combat society in that mortal struggle whose only object is the freedom to love, to love in the material comfort rejected by the “pure in heart”. Respectable Mums betray the lovers. The latter thus avail themselves of the right to turn against respectable Mums. The feelings of the couple are very complex, for love today is under powerful external pressure. He still maintains some illusions. She, freed from all bourgeois prejudice, wants to live without working, obligatory work surely being the greatest evil of a world where the sweat of some serves the indolence of others. Thus will disagreement be engendered: love interrupted by flare-ups. Each time passion will be victorious. Whatever their personal ideas, Annie Laurie and Bart are powerless to part. Their descriptions are broadcast on every radio station, the embrace of the police draws them tighter together. There remains only one way for them to be saved: to separate and find one another two months later in another country. Each in a different car, they drive off in opposite directions after having embraced one last time. The cars have not gone fifteen metres when, in a single movement, they both make U-turns and rush towards each other. Without saying a single word, Annie Laurie jumps into Bart’s car and they launch themselves towards their mortal destiny. Prudence is a word devoid of sense for lovers. Their smile flares up, triumphant: conscious of the dangers that they run together, ready to confront death, they prefer this to separation. After having defended themselves against the police who have tracked them into the swamp, a last violent disagreement induces Bart to shoot Annie Laurie. Their pursuers, thinking themselves attacked, machine gun the couple (3). They die in each others arms and the last words Bart speaks as he looks at Annie Laurie’s corpse are “I wouldn’t have it any other way” [“Je ne regrette rien”]. “A little thing like … a foreign name can set you apart” in the United States (really?). Scripted comments like this, as well as his work with (blacklisted) Dalton Trumbo (Gun Crazy), Philip Yordan (The Big Combo) and even Larry Parks (The Swordsman) indicate Lewis’ alliance, if not affiliation, with the left (4). This may be one of the reasons that his career never really made it out of the Bs. She (Hedy Lamarr) searches for a home in the U.S., headed by a father who is himself an illegal alien in that country – that is, her dream is a false one, leading her to the same state as before. This may give some clue as to the personal concerns of Lewis in describing the sexual relationships of his personages – he seems most interested in their being outsiders. It is that common quality which draws them together; it is not love that separates them from society. Dramatic visual effects emphasise the action scenes, especially John Hodiak’s flight & escape in hotel room. Camera moves in at end and CUs increase thereafter, as well as a particular motion, used to emphasise insecurity or dilemma (comes at end of shot and sequence) which is the reverse of the fantastically beautiful motion of the opening shot from the car window. Dreamlike image of the navy plane and the reflected faces of the immigrants (cross-ref: Karina’s face & the city of Alphaville) blends hope and despair – the small diving plane is as threatening as a hornet as it overlaps the upturned faces of the passengers (the master plagiarist, NxNW). Then, it is the dream that Lewis explores – either externalising it, as here – or documenting the actions its internalisation causes. But since this kind of thing can be said of a lot of others, something else must explain the specific hallucinatory quality of Lewis’ work. Visually some of that effect comes from the isolation of characters from settings – when one is outside, one is adrift in no place. In Gun Crazy, Lewis had based his complex mise-en-scène on the visual correspondence of marksman to target, switching viewpoints at key moments. (One such cut, from Laurie about to fire to a terrified woman supervisor about to be shot, jolted the viewer with the realization that Laurie, unlike Bart, was a born killer.) The shifts in perspective in The Big Combo were aural rather than visual. Throughout the story, McClure’s [Brian Donlevy’s] hearing aid establishes his impotence in relation to Brown [Richard Conte]: inserted in Diamond’s [Cornel Wilde’s] ear and plugged to a radio, it creates a novel form of torture that leaves no physical mark on the victim. Diamond twists in pain, but we only hear dialogue at a normal voice level. Delivering the treacherous McClure to Fante [Lee Van Cleef] and Mingo [Earl Holliman] for execution, Brown disconnects the hearing aid in a mock-generous gesture: “You won’t have to hear the bullets.” (5) Cut to the sub-machine guns blazing away in dead silence. In every successful film, the individual contributions of director, writer, and cameraman must join without a trace. The Big Combo was so secure within the gangster film tradition that it could enjoy the luxury of abstraction. Alton could dispense with décor and define space with a pool of light, as in the scenes set in a fog-bound airfield. Yordan gives full rein to his invention, knowing that by then gangland was psychological terrain. Lewis could charge two-shots with such tension that he could dispense with the usual violence. Such chances paid off because the filmmakers were aware that genre could fill in the empty spaces. -Carlos Clarens, Crime Movies: From Griffith to the Godfather and Beyond, W. W. Norton & Company, New York, 1980, pp. 232-233. -Joseph H. Lewis, quoted by Charles Tesson. Uh-oh. This is not quite what Gilles Deleuze meant in Cinema 1, University of Minnesota Press, Minneapolis, 1986, p. xiv. That old auteurist meant “great directors of the cinema”, and Joseph H. Lewis does not figure in his index, although Jerry, of course, does. Alas, Gilles was a pomo snob. After the usual previews in small town America the producers took account of the corrosive morality of the film and, wanting to erase the bad impression produced on a public not forewarned, they replaced the title with a ridiculous phrase taken from the Bible: Deadly Is The Female. [Note in Ado Kyrou’s original text]. In the film they don’t use machine guns, but Kyrou does (“ils déchargent leurs mitraillettes sur le couple“). I can’t resist mentioning that Kessler in his killing trance in The Invisible Ghost always heads for the servants quarters first, and that I don’t think that this is coincidental. This is not what he says. See Rick Thompson’s article in this issue for the correct quote.